In Integrity and Authenticity (Part 1), we examined the rejection of the Gospel of Jesus Christ, in favor of another “gospel”. The World has an entirely different idea of what constitutes “good news.” We are living in an age which celebrates a false gospel: that a rewarding life is one built on pleasing self…but this way is living a lie. If our gospel is not rooted in submission to the Lord, it is a false gospel, because we were not created to please ourselves, but to please God. God is kind to us. We can know what pleases Him, because He teaches us this in His Word: For you will not delight in sacrifice, or I would give it; you will not be pleased with a burnt offering. The sacrifices of God are a broken spirit; a broken and contrite heart, O God, you will not despise (Ps 51:16-17). God wants our messy, broken hearts. He wants us to see what He sees: how much we need Him. Christians, we should be careful. Seems like we tend to fall to one side of the fence, or the other. Why do you see the speck that is in your brother’s eye, but do not notice the log that is in your own eye? Or how can you say to your brother, ‘˜Let me take the speck out of your eye,’ when there is the log in your own eye? You hypocrite, first take the log out of your own eye, and then you will see clearly to take the speck out of your brother’s eye (Matt 7:3-5). 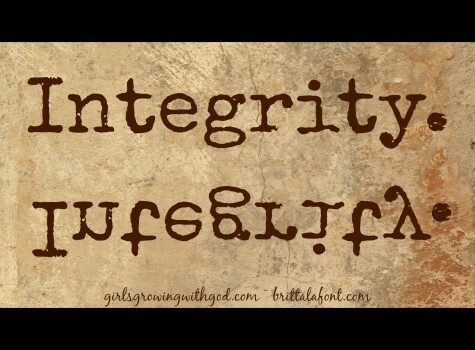 Somewhere between living under condemnation and being swelled up with pride…this is where we find Integrity. When we can see the sin in ourselves, repent, and feel how we have been freed…this is Integrity. If we confess our sins, he is faithful and just to forgive us our sins and to cleanse us from all unrighteousness (1 John 1:9). Have you felt your sin, heavy on your heart, and then felt forgiven…so the tightness left your chest and you could breathe again? If not, you should read Psalm 103. When we can see the sin in others, and grieve for them, instead of being grieved by them…this is Integrity. Love does not rejoice at wrongdoing, but rejoices with the truth (1 Cor 13:6). This is when we come to Him, weary from trying to make everyone else behave the “right way”, and He gives us rest. This is when the “I told you so” doesn’t threaten to spill out, because Grace spills out instead. The good person out of the good treasure of his heart produces good, and the evil person out of his evil treasure produces evil, for out of the abundance of the heart his mouth speaks (Luke 6:45).